There are 2 crucial dates when examining the history of today's domesticated cats. The oldest evidence of skeletal remains that looks more like today's cat and less like a wile animal dates from 15,000 years ago. More clearly, however, there are several tombs on the Island of Cyprus where feline skeletons were found, and one in particular where a cat skeleton was found inside an earthen jar and buried alongside a child. The evidence is abundant that cats were domesticated on Cyprus, and the year was 9,000 years ago. Whenever mankind has domesticated a wild animal, the initial purpose is always utilitarian as the effort is extreme. Today's inquisitive house cat is mild mannered compared to the original Bob cat cousins roaming the lands 9,000 years ago. When mankind moved to an agrarian society, stores of grain and other foods were created and small towns were then able to flourish as there was a clear division of labor. Cats were crucial in protection stores of grain from rats and other animals looking for a free meal. Since that time, cats are our companions, members of the family, frisky and fun and entertaining. Our cat Christmas ornaments can be personalized to celebrate your favorite feline friend. 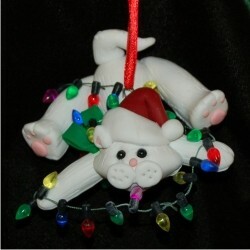 We offer personalized cat ornaments in resin, hand crafted polymer clay and blown glass.